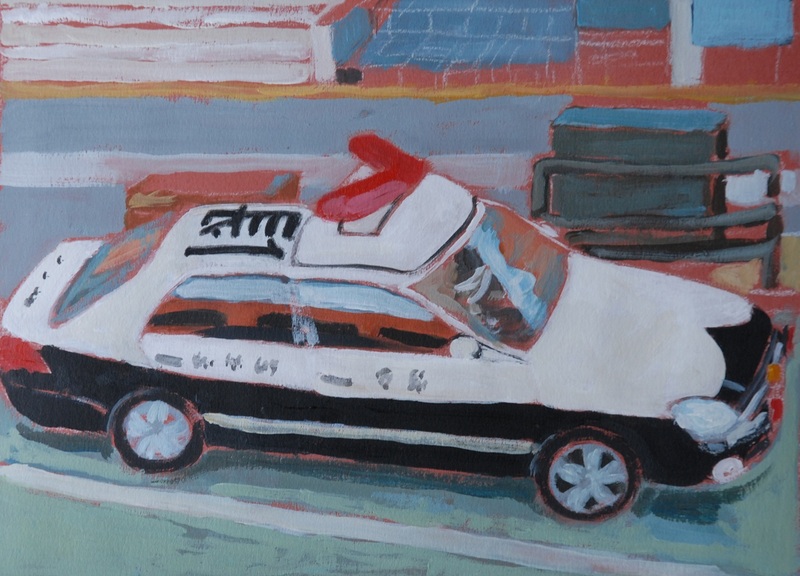 Japanese Police Car 2010 | J.Harms. Japanese Police Car 2010. J.Harms. Acrylic on red paper. (Private collection). It was so easy to be inspired in Japan. All I had to do was sit and watch. Which is the story behind this painting. A police car stops at a red light. I take a picture. I sip my coffee. I forget about the picture. A couple months later, I find it among the hundreds I took. I remember the day I was sipping my coffee and looking out the window, that’s when I really start looking at it. I find it pretty. I think it looks like a super-hero ! I love this painting. And I agree about the superhero idea.